Today is Motorcycle Monday for me! I like to ride my bike to work on Mondays as something to look forward to getting out of bed for. It was 50º and sunny this morning, and has been forecast to hit 70º this afternoon. So, no excuse not to ride! I even made it to work on time! Ha. This past Saturday, I brought the Nighthawk out of hibernation and got it ready for my third year of riding. I kept the battery on a trickle charger all winter, so when I hit the start button, it fired right up. Hooray! I changed the oil, lubed the chain, put air in the tires, and greased everything that needs to move. 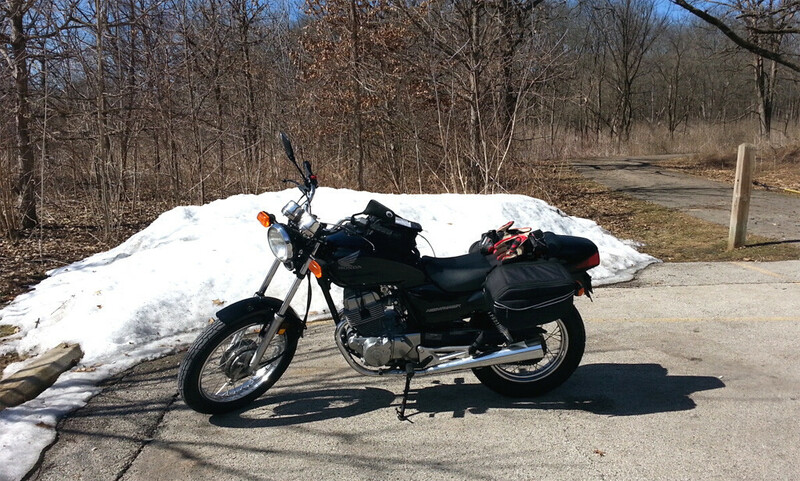 After letting the engine warm up again, I took off for my first ride of the season. Everything came back to me much more quickly than it did the first ride last year. Once out of the driveway, I headed west to get to a less populated area and meander down some familiar roads. The bike rode great! Just as smooth and fun as I remember. I somehow ended up at the municipal airport in Aurora. I didn’t know Aurora had an airport! Ha. I rode into the parking lot and watched some small planes land and take off while I drank some water and stretched. I only rode about 60 miles on Saturday because it got a bit chilly later in the afternoon, but I felt great afterward. Exhausted, in a good way. I saw 6 other riders out during my ride. I assumed I would see more since it was the first nice weather we’ve had in so long, but maybe they were out riding somewhere else. Right at the end of last season, I had to replace my gloves because the wrist strap tore away from the rest of the glove, so I couldn’t tighten it properly. Since Sedici products have a lifetime guarantee, I just went to Cycle Gear and showed them the issue, and they replaced them with a new pair of the same kind. The new pair is a little stiff and uncomfortable at the moment until I get them broken in more. The major drawback about new gloves! Speaking of gear — I hope to get some new riding boots this year. I have riding shoes at the moment, which are like armored hi-tops basically. There is nothing wrong with them, but I would like something that covers more of my shin and lower calf. I’ve looked at a few pairs, and it’s going to be somewhere in the $150-$200 range. Oof. Why is motorcycle gear so expensive? Can anyone tell me that? :p I’m not sure when I’ll be able to make that purchase, so for now I’ll be sticking to my riding shoes.